Metal rod telescopes from 36 inch to 66 inch or 66 inch to 120\"
The rod extended just as advertised and went even a bit further. I have a very large window and this was my major concern. It comes with all the hardware to hang and has a center brace to hold center of rod if needed for use with heavier curtains. The rod itself is slender which I found great for the curtain type I picked. (panels that thread the rod through the top) Also, the picture does not do justice to the ornament ends which in person seem a bit bigger to me therefore in my opinon makes it look like you spent a bit more than you really did. 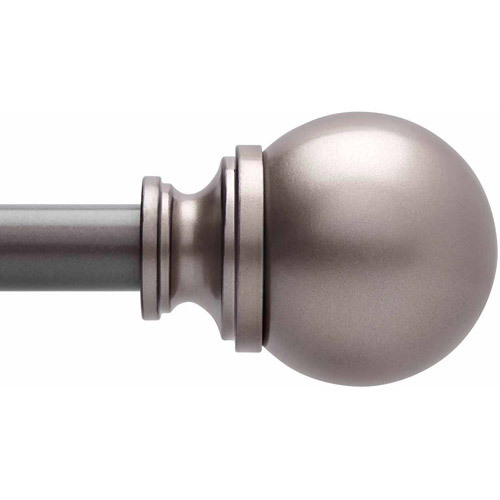 Home territory searches the web to find the best prices and availability on Window Hardware and related products foir your home like Better Homes and Gardens Curtain Rod Set, Pewter, 1" rod diameter. For this page, related items include products we find that match the following keywords: "Window Hardware" at our vendor partner Walmart - Click More Info / Buy Now to check for price rollbacks!. Better Homes and Gardens Curtain Rod Set, Pewter, 1" rod diameter is one of 144 Window Hardware and related products available for sale through HomeTerritory.com, If you have any questions on this product, please give us a call at 734-971-1210 during the hours of 9am - 5pm EST for assistance. Thank you for shopping at Home Territory, the home furnishings superstore!